The seemingly endless possibilities for creativity and commerce with WordPress never cease to amaze me. With the right combination of imagination, plugins, and themes, there’s not a lot you can’t do with WordPress–from simple blogs, to eCommerce stores, to custom web applications and more. Not only is it possible to do such things, but its usually pretty affordable too. Websites that would normally cost thousands upon thousands of dollars to build (and require a team of designers and developers) can be launched and managed by a single individual. That’s certainly the case when it comes to creating an online marketplace with WordPress. Traditional, custom solutions would be nearly impossible for the average person to create. But with WordPress just about anyone could take a crack at the next big online marketplace for just a few hundred dollars and the labor involved. In this post I’ll be going over the broad strokes that process entails. Starting with a clarification of terms. What is a WordPress Marketplace? Most WordPress users are familiar with the fact that WordPress can be used to create an eCommerce store on their website. But not all may be familiar with the distinction between a store and a marketplace. Where as a store is typically just one vendor selling their goods/services, a marketplace is a collection of stores with many vendors. Those who create the marketplace set up a system in which vendors can create accounts, sell their own products/services, and upon making those sales earn a small commission for the marketplace. When scaled, this can (and has many times over) result in massive revenue for the marketplace. As I just mentioned above the biggest benefit of building and running a WordPress marketplace, and probably the only one that really matters to most people, is the fact that as it grows so does your potential to generate large amounts of revenue. All you have to do is take a peak at the examples of successful marketplaces below to see how staggering the numbers can become. But, of course, that all depends on your ability to do some pretty challenging things. Such as find a large niche that you can compete in, create a quality framework (and a great user experience) for multi-vendor buying and selling to take place within, and of course attract both vendors and customers alike. Ideally, choosing the right niche and creating a good user experience (for both vendors and customers) equates to winning most of the battle. As vendors make money from your marketplace they will literally make it their business to drive traffic for you. And customers that have a good experience will return and tell their friends. This is why the focus of this post is not on the logistics of how to run a great WordPress marketplace, though that may make a great follow up. Instead, it is all about the tools you will need to create one–which will empower you to do the rest in stride. Thankfully, when it comes to WordPress and tackling a particular use case what that really means is finding and configuring the right set of tools. This is the case with building a WordPress marketplace too. 1. 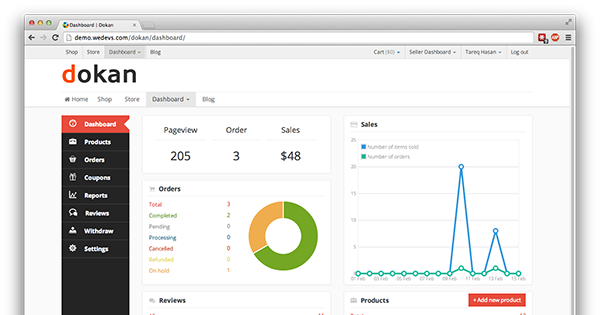 An eCommerce plugin solution with marketplace functionality–such as vendor signups, vendor store management tools, and commission management (at a minimum). 2. A theme that supports said marketplace functionality with custom templates, styles, and perhaps a few minor functions of its own. In the two sub-sections below I’ve gathered together some of the best plugin and theme options available for building a WordPress marketplace. It’s important to remember when setting up a WordPress site/service that you should make sure the lions share, if not all, of your site functionality lives in plugins–not your theme. That way you’re able to update the look and feel of your site in the future (by changing themes) while maintaining the functionality that makes it work. When it comes to building an online marketplace with WordPress, these are the best plugins for providing the needed functionality. First up we have a combination of WooCommerce, which may be the most popular eCommerce plugin for WordPress, with a premium extension called Product Vendors. Without the Product Vendors extension, WooCommerce is only equipped for a single-vendor setup. With it, you’ve got everything you need to create a stellar marketplace for digital or physical products. Plus, you can use any theme that is compatible with WooCommerce. This really opens up the options in terms of themes. The Easy Digital Downloads Marketplace Bundle is probably the best option for non-physical products. If you’re selling ebooks, videos, themes, plugins, audio, or anything similar then this bundle is exactly what you’re looking for. By Pippin’s Plugins, Easy Digital Downloads itself is a massively popular free plugin for selling digital products as a standalone vendor. 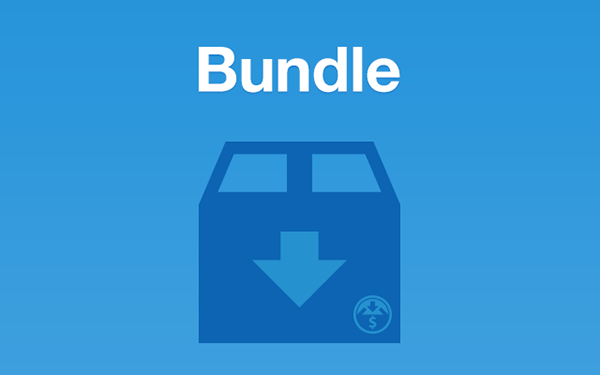 The bundle, which is actually seven extensions, is everything you need to expand into a full marketplace. Each link below will open up the details of the extension. And in terms of compatible themes, there may not be quite as many as for WooCommerce–but the pool is definitely growing. You’ll see several below, but more can be found at the Easy Digital Downloads website via the More Information link. WP Marketplace is a somewhat new contender in this space with significantly fewer downloads/customer feedback to base a recommendation on. However, it is free and that will matter a lot to some people. All that said, WP Marketplace looks like a pretty cool plugin with a lot useful features. At the moment it has a solid review average in the WordPress plugin repository and a surprisingly robust amount of functionality. Now its time to style all that wonderful functionality with the right theme. I’ve collected several below that are designed to work with either WooCommerce or the Easy Digital Downloads Marketplace Bundle. 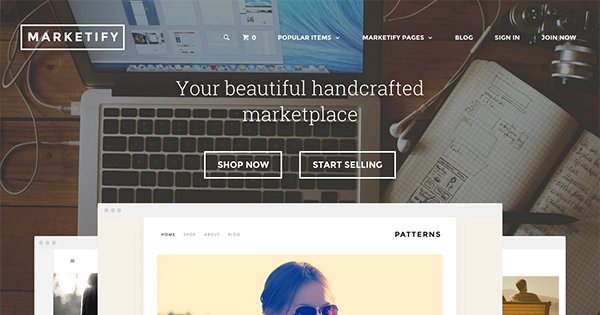 WP Marketplace, supposedly, works with any theme–so that’s awesome! Storefront is a new(ish) theme by WooThemes designed to be the free default theme combo with their flagship plugin WooCommerce. It’s guaranteed to always have “water tight” integration with WooCommerce and WooCommerce extensions. Storefront itself also comes with several plugin extensions meant to add more turn-key design/development options to users. 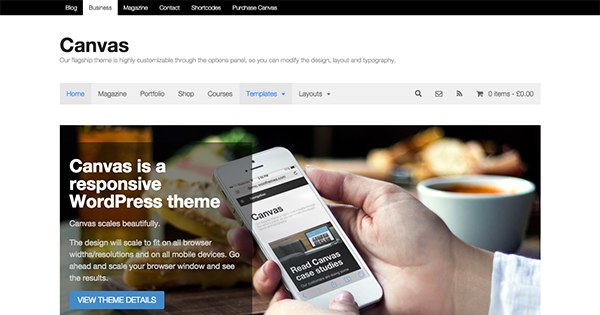 Canvas is WooThemes flagship theme. It’s designed to be their most robust and flexible theme. As such it also has very tight integration with WooCommerce and WooCommerce Extensions, making it a solid choice as the base for your WooCommerce Marketplace. But just because Canvas is their flagship theme doesn’t mean that it is their only solid marketplace option. You could choose from any one of their (or a third party’s) WooCommerce compatible themes. Marketify is a beautifully designed theme from Astoundify (via Themeforest) built for use with Easy Digital Downloads. This is a great theme for selling photos, fonts, videos, audio, or any other digital product. And the design will go a long way towards providing your buyers and sellers with a great experience. Squarecode is another attractive, well crafted theme designed to work with Easy Digital Downloads and its extension bundle. This theme has an impressive feature list and great reviews. 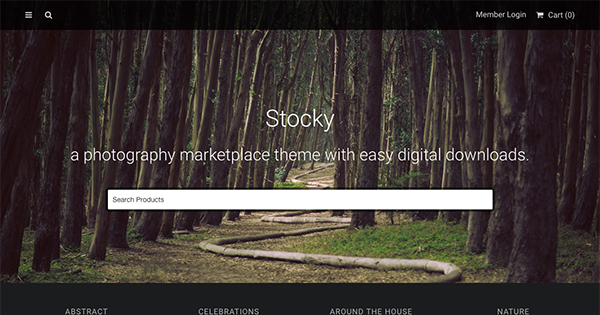 Finally, the last (on this list) of Easy Digital Downloads compatible themes is Stocky. 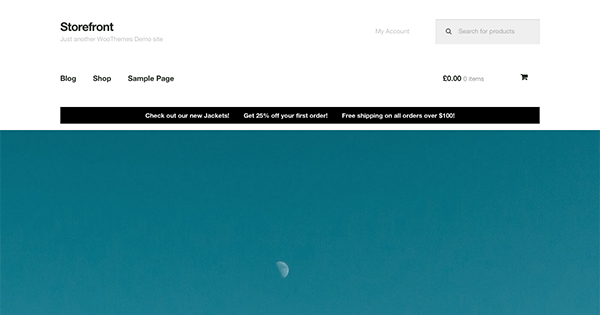 Stocky has a great design, is responsive, retina ready, and setup to support the full EDD bundle. A perfect solution for selling stock photography. Dokan is interesting in that it is not just a marketplace theme but a theme/plugin combo. While it technically works with WooCommerce, it also provides unique backend features and customization that you won’t get with any other theme/plugin combo. Note: there are two themes that I had originally planned on including here. HireBee and FreelanceEngine, both being themes for creating job marketplace sites with WordPress. The reason they are not listed with the themes above is that it was unclear whether or not their functionality was separated out into plugins or not. If you’re looking for inspiration, the marketplaces below are some of the biggest and most successful in the world, or at least in their niches. 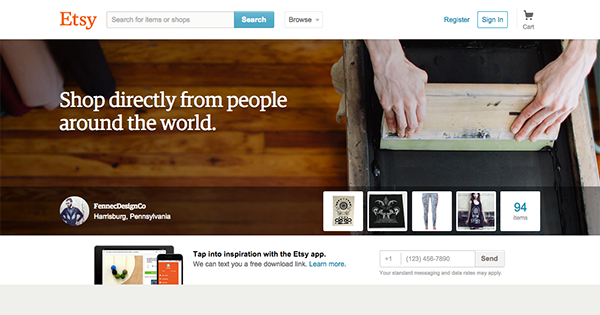 Etsy is the defacto online marketplace for buying and selling hand-crafted goods. In 2013 they passed a pretty major milestone: $1 Billion in sales. 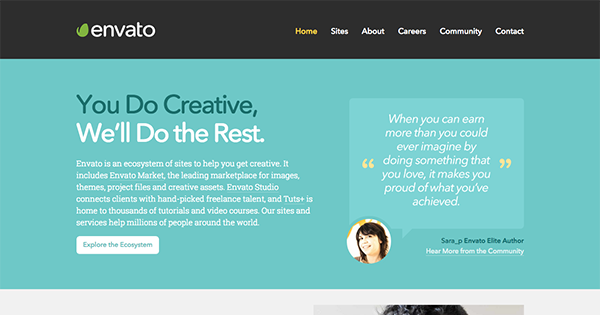 The Envato market is actually a sort of meta marketplace. Instead of a mere collection of stores its a collection of niche markets. A very successful one. Last year thirty of their most successful vendors each generated over $1 Million in sales each. 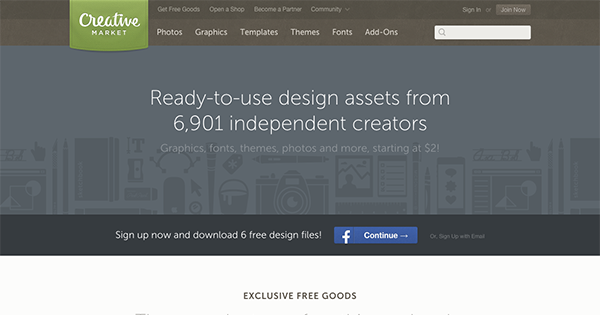 Creative Market is a size-able marketplace designed to help creatives sell digital goods. So far they racked up an impressive 169,801 products, 778,335 members, and 6,901 shops. Not much needs to be said about Amazon. They’re so successful they need no stats to brag about. If you’re interested in creating a WordPress marketplace then there is more than enough tools and resources at your disposal to give it a try. That said, being a successful marketplace is going to be a lot tougher than simply building it. The web is not the Field of Dreams, simply building it will not make them come to you and it certainly won’t make them buy. But like I said earlier, that’s probably the topic of another post. What did you think of the plugins and themes featured in this post? Would you consider taking a crack at a new marketplace built on WordPress? Share your thoughts with us in the comments section below. Can you tell me if Divi (Elegant Themes) will work with WooCommerce? Yes, Divi is fully integrated with WooCommerce! Try it out Ray. I think that WooCommerce is the best eCommerce WordPress plugin! Great article! Love that wordpress and plugins make anything possible for One person to set up a store. Now to think of an idea and start building! WE-Vendors is another free marketplace plugin. Currently free and has a lot features. Works with woo and Divi. Thanks, Nathan. I don’t leave comments often but I have to admit – I find your articles extremely interesting. The best thing is that they contain the right mix of professionalism and ability to explain things in simple, easy to digest way. What Forms are good plugins for Divi. I need a partial eCommerce as my customer wants to be able to select from a list of things but then store the credit card information so that they can process it with their own Point Of Sale. Wow what an excellent post, actually what i am interested in is the small snippet announcing the freelanceEngine, this is something we are actually looking to implement as part of our new venture. This is a great post and thanks for sharing… I need to know if there is a plugin like Dokan that is Multi Sites friendly? Nice article that gave me lots of ideas. Thx. I plan to set up shop on the Word press and your article is very timely. You missed MarketPress by the guys at WPMU Dev (https://premium.wpmudev.org/project/e-commerce). Has what you need out of the box no add-ons to purchase. Well before you can even download it you have to pay for it. How scalable would these solutions be using WordPress? I mean, I wouldn’t want tp build something like the original healthcare.gov that could pnly handle about a dozen concurrent users. Anybody know? Scalability is not really down to the website per se. Its a server thing. I would think that wordpress.com gets a few million hits a day and its built on WordPress – It could be something to do with having the mother of all servers and great connectivity down the line. Of course, you will need a robust ecommerce solution that can take many requests but as you grow, you can scale. Wow, that was a great description an introduction of tools needed to install a marked place. It will help me a lot! Hey, that was an awesome post. At first glance Marketify looks really cool, but I think Stocky has the best design in my opinion. I also like Dokan, but I don’t like mixing themes and plugins. So for me I would choose Stocky if I went for Digital downloads. With Woocommerce I would choose Divi of cause. But that’s just me. Great post anyway. Thanks for sharing. You can use Dokan as a plugin and use any WooCommerce compatible theme you want. Any WooCommerce compatible theme will work fine with Dokan. 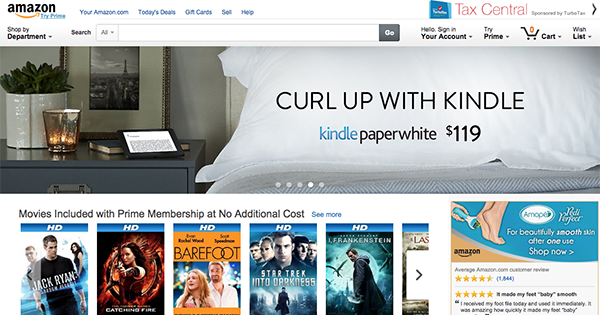 It is also cool for downloadable products as well. Good list, but recently I came across Listify, by Astoundify (https://astoundify.com). It’s a marketplace theme built on the WP Job Manager plugin and its addons. If you are building a marketplace this is defnitely one to try out. Thanks for sharing with us this link (https://astoundify.com). is this a theme or plugin or combo stuff? how much is this theme and where it can be purchased? Divi is for the moment an excellent All in one theme for the products i am promoting, but some of these plugins might prove useful in a close future. Do you have an example of Market place that have been developed using DIVI? excellent article, Sietse :you mentioned listify on themforest if the marketplace need to be integrated to reservation system. Is listify for single store or marketplace and will be able to cater individual vendor reservation systems ? does anyone know ? I am trying to create marketplace where i can sell physcial products along with reservations and event bookings. Need expert help/inputs on possible plugin/combinations. Hi, VeganTJ, have you had any luck in finding a marketplace plugin with event bookings and reservations? I’m looking for a similar thing that can show availability of vendors for specific dates. Is it possible to run a marketplace where members both buy & sell, storing their earned money for later purchases in their account? Kind of like an online “Community Dollars” scheme? If I use marketpress with storefront will I be enable to create a full working marketplace that give vendors possibility to insert their produtcs? or I need to add some extension? Cool! Have anybody tried Joobi J market for Joomla?. It is an extension to create a marketplace and it has a lot of features. Is quite complex-maybe somebody experience using it could break it through. I want to start a marketplace for the sector I am in, so that others can post their products for sale on a commission basis. Looking at these sites but any recommendations welcome, thanks. I’d like to start a website at my school where students can buy and sell (and rent, if that’s possible), books from each other. Ideally each person would have a “profile” so that buyers and sellers can communicate to determine a pick up location. It’d also be good to have a shipping option, and all payment through the site. If this were to expand, I’d like buyers to be able to sign on and search by zip code or school name. Does this seem feasible? It seems like a lot of the wordpress themes are more focused on digital products, and I’m hesitant to spend money and attempt this without being sure of the correct theme/plugins. http://siteturner.com/best-multi-vendor-wordpress-marketplace-themes/ seem like good options, but any recommendations or advice on which themes to use would be much appreciated!! I want to start a marketplace similar to craigslist. I would like if my customers are able to list not just products, but also services. Of course, unlike Craigslist, there would be transactions taking place. Is that possible with any of these themes? I’m just about ready to download Divi ,but I need conformation that it will mate well with Easy Digital Downloads.That is critical as I will be selling digital products. Obviously I could eventually figure it out, but the thought of Divi relatively being plug and play, whereas I can vastly concentrate on my strong point, content is very alluring. Thanks in advance for hopeful conformation and any possible advice. I’ve been really considering Jmarket by Joomla as my Wordress plug in for my e-commerce needs. Jmarket seems to offer all the options I need for my website. Not to mention, it seems to be an out of the box application [that] doesn’t require a lot of programming. There are not a lot of reviews about Jmarket, so I knew, if “anybody” could give me an unbiased opinion about Jmarket, it would be “YOU”!!! I would greatly appreciate any information or advice about Jmarket you would have or recommend…. BTW, great articles and information about WordPress… Keep up the GREAT work. Barry, I am not a user of jMarket but am researching it, also. I just wanted to let you know that on chat this week with staff at jMarket, their own support person literally told me that he wouldn’t recommend using jMarket with WordPress–it is in Beta and not considered stable for WordPress. He recommended that if using jMarket, using it with Joomla. i want to make my own multi vendor site with wordpress, ive never used wordpress before so i really need to know if i need to have a least a premium plan to be able to add a plugin like dokan in my website. I was just curious what you thought of WooCommerce as far as ease for the vendors to set up their account. My market will be full of individuals with little to no computer experience so I wanted to make sure that I can make it as simple as possible for them to list their products. Like take a picture, description, price it, delivery options, and thats just about it! Do any of the above wordpress themes support a listing fee function before the product is sold? This listing fee payment would be made when the product ad is created by the seller and before they find a buyer to sell their product on the website. I’ve having a lot of trouble finding a solution to this to build my website, any help would be greatly appreciated! Can be Divi theme be used for a marketplace or multivendor website? 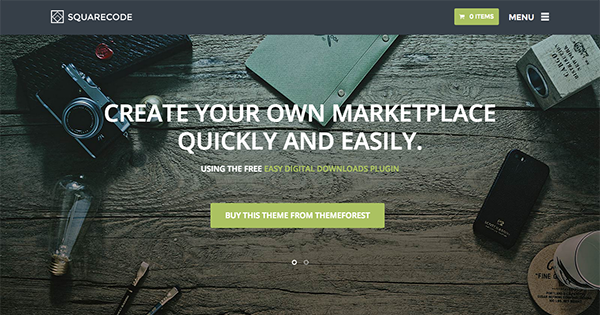 Is it better to use a WordPress marketplace theme or a marketplace plugin? Can you please fix this ! Do any of these marketplace solutions also include an affiliate platform? I am guessing this may need to be a completely seperate program? Will definitely keep this post in mind, as I am considering building a marketplace for financial services. If i use the solution woocommerce+ storefront, how much can i costumize the design? If i need to redesign too much the layout ( for example a scrool down home page) is better for me try the solution woocommerce+ wp-marketplace?